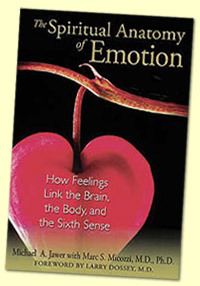 Michael A. Jawer with Marc S. Micozzi, M.D., Ph.D.
Order your copy of The Spiritual Anatomy of Emotion today! Based on differences in how each of us literally feels – our innate sensitivity -- the more physical disturbances we are likely to have: from ailments such as migraines, fibromyalgia, chronic fatigue, and post-traumatic stress to anomalous perceptions such as apparitions and involuntary out-of-body experience. Using the latest research on immunity, sensation, stress, cognition, and emotional expression, the authors demonstrate that the way we process our feelings provides a key to who is most likely to experience these phenomena and why. They explain that emotion is a portal into the world of extraordinary perception, and they provide the studies that validate the science behind telepathic dreams, poltergeist disturbances, and more. The Spiritual Anatomy of Emotion challenges science’s prevailing belief that the brain must necessarily rule the body. Far from being a mere by-product of neurochemistry, the authors show that emotion is the vehicle by which we can understand ourselves and our interactions with the world around us as well as our most intriguing—and perennially baffling—experiences.